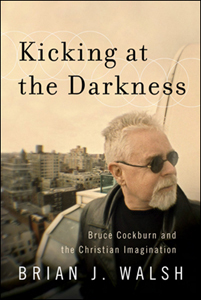 22 November 2011 - Here is a link to an excerpt from the soon to be released (December 11, 2011) book, Kicking at the Darkness, Bruce Cockburn and the Christian Imagination by Brian Walsh. Also, On April 19 while in Grand Rapids Bruce will be interviewed by Brian Walsh who is the author of the soon to be released book on Bruce called Kicking at the Darkness. This will be a public interview held at Calvin College. Time TBA.